From our living rooms to public stages, we can’t seem to get enough of one of our oldest art forms. Melissa Ferrick performs at the WGBH Stories from the Stage series. Alonso Nichols looks sly as he recounts the time he and his twin brother were playing Indiana Jones, using belts as whips. A buckle whacked one of Alonso’s front teeth, breaking it in half. At dinner that night, he tried to hide it from his mother. “I stuff a piece of meat, and then some mashed potato inside the hole in my teeth. But the jig is up. She knows.” Nichols’s tale of brotherly mischief charms his audience members who, as it happens, are sitting in his living room in Medford. 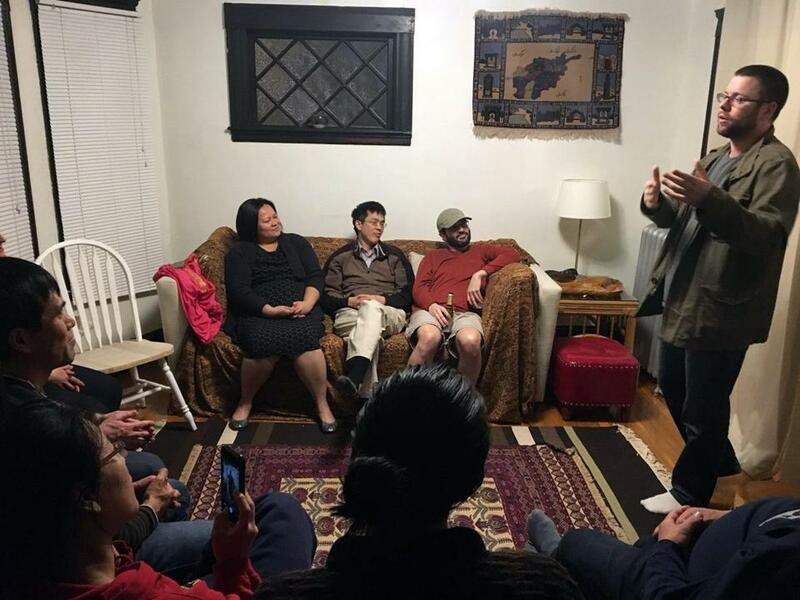 Nichols and his wife, Grace Talusan, are hosting a gathering of the live storytelling club StorySlam! Its monthly meetings rotate through different members’ homes, with the host serving food and guests bringing drinks. Nichols, chief photographer at Tufts University, and Talusan, a writer, serve chicken adobo while their guests sip beer, chat amiably, and scribble their names onto paper strips they stuff into a glass jar. After dinner, Javed Rezayee, who founded StorySlam! in 2016, asks the 10 people in attendance to stand up and pair off, and proceeds to lead them through “Milk the Cow,” “Caterpillars into Butterflies,” and other vocal and movement exercises that serve as both icebreakers and warm-ups for the hour of storytelling that follows. When they’re finished, he pulls a name out of the jar, and that person has six minutes to tell a story, no notes allowed. Some stories, like Nichols’s, are mesmerizing and succinct, others meander, but everyone offers encouraging notes after sharing. Just as readers have book groups and writers have writing groups, StorySlam! offers storytellers a chance to socialize and workshop. That StorySlam! exists, let alone has more than 100 members on Facebook, shows that interest in humankind’s oldest art form is still growing. Last year The Moth, the New York literary group behind the popular Public Radio Exchange-distributed program and podcast, turned 20. It is now producing more than 500 live events a year, including three a month in the Boston area. Boston-based Massmouth turns 10 this year and runs monthly slams at Boston’s Trident Booksellers and Cambridge’s Club Passim. In a given month, fans could pay $5 to $12 to catch Fugitive Stories in Arlington, West Acton, or Framingham; visit Story Space Open Telling sessions in Somerville; hit Now Listen Here events in Dorchester; or head to Jamaica Plain for StorySlam! at Doyle’s or Story Club Boston at the Milky Way Lounge. And that was before public television powerhouse WGBH launched Stories from the Stage, a half-hour program featuring live, curated storytelling. The show, a co-production of Massmouth and the World Channel, debuted in October, becoming the first national TV show dedicated to storytelling (its potential audience expanded in January, when PBS began distributing it). Massmouth’s Cheryl Hamilton created a storytelling series to help people relate to the experiences of immigrants and refugees. Read: Come on down to Norwood for . . . art and craft beer? Participants attend a StorySlam! gathering last April. The yellow brick road didn’t appear before Rezayee, the Story Slam! founder, the first time he went to a live event, a Moth show in New York in 2013. “How can you share your very personal details with strangers?” he thought to himself. At the same time, he was fascinated, and kept going. Then he had an idea: Maybe he could pitch storytelling as an after-hours activity at his employer — the Open Society Foundations, an international grant-making network founded by George Soros. His human resources department agreed. The first session drew about 50 people, with high-level directors sharing stories about their cats alongside entry-level program assistants. It became a bimonthly event, one that Rezayee says improved work relationships. By 2016, Rezayee had performed live a handful of times, and was hooked. He decided he wanted to focus on writing and live storytelling, and moved back to the Boston area, where he had attended college, and could live cheaply with roommates. 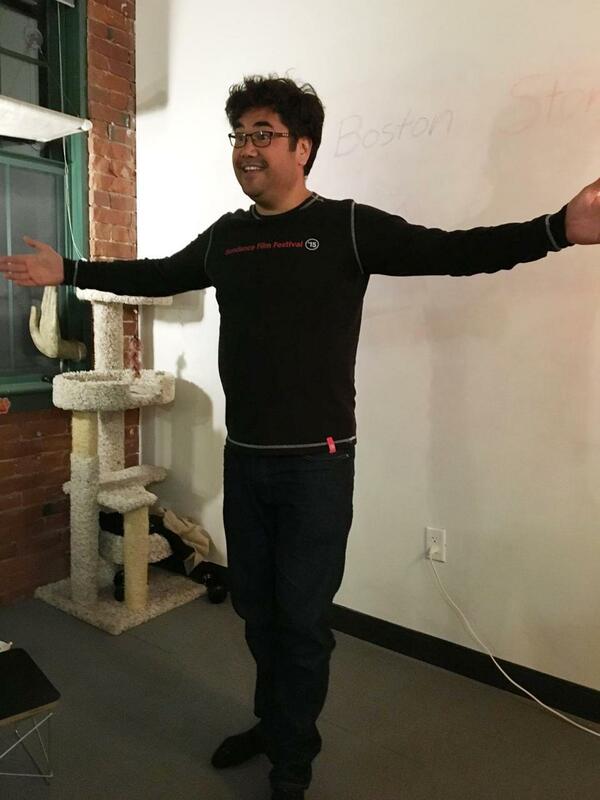 He runs occasional storytelling retreats and workshops for companies and organizations looking to strengthen teams, and teaches classes on the art of storytelling at Tufts University and GrubStreet creative writing center in Boston. And he hopes his StorySlam! club might someday lead to more jobs. Rezayee, who’s tall and barrel-chested, breaks into a boyish smile when I ask him if he’s able to support himself as a storyteller. “Have you ever heard of a starving artist?” he answers. But he loves what he’s doing, not only because he meets so many people, but because he sees its potential as a social tool. Javed Rezayee in storytelling mode at a StorySlam! event in 2017. Picard also says there’s an element of “free therapy,” since so many people tell stories that involve their families. Once he told a story about his teen daughter and the moment he realized she was smoking. “Telling it in front of a Cambridge audience, you would have thought I’d found a gun!” he says. His daughter didn’t know he’d found cigarettes in her jacket until he shared the story at Oberon, in front of 200 people, including her. His sister-in-law, also in attendance, later told him, “You have an interesting parenting style.” Picard says telling it as a story let him vent his emotions, so that later he and his daughter could have a less charged conversation. Inside, audience members sit at round cafe tables, snacking on pretzels and drinking wine and beer purchased at a bar set up in the back. Cabaret lighting sets the mood — no bright flood lights here — and camera operators use hand-held digital SLRs, instead of the typical hulking studio cameras. Alexis Kubana performs at the WGBH Stories from the Stage series. Many storytelling events are organized as “slams,” where judges award winners chances to compete at larger venues and/or cash prizes (usually around $50). Stories from the Stage follows a different format. Liz Cheng, WGBH/World Channel general manager for television and co-executive producer of Stories from the Stage, calls it “a convening, as opposed to a competition.” Coaches work with both storytelling masters and first-time multicultural storytellers, who share stories that reflect America’s diversity. Over the course of the night, we hear from an East African woman who bucks family tradition by exploring life as a comedian in the United States, an Andover teen librarian who goes on an awkward ghost hunt in Kentucky, a man from India who knows the world better than he does his own country, and a singer-songwriter who at age 21 almost skipped her chance to open for Bob Dylan. Come on down to Norwood for . . . art and craft beer? Alysia Abbott is a writer in Cambridge. Send comments to magazine@globe.com. Follow us on Twitter @BostonGlobeMag. This story has been updated to correct a photo credit. The picture of Melissa Ferrick was taken by Sharon Wong.